Onyx Studio 5 wurde bewertet mit 4.0 von 5 von 48. Rated 5 von 5 von Runjemirun aus Blown away by this Full disclosure I got this speaker for $200 from Sprint and it came with a plane ticket but I’m blown away by the quality of this speaker. I haven’t had the chance to truly break it in yet but the volume, clarity, and feel are fantastic. I haven’t seen any information about it’s weather resistance which concerns me and for almost $500 I’m not convinced it’s worth that much. If you’ve got the money or find it on sale you’d be a fool not to grab it! Rated 5 von 5 von badger60 aus HK ONYX STUDIO 5 ...EXCELLENT DEVICE! just bought this, bigger than it looks about 29cm x 29cm quite heavy won't fall over easily....absolutely fabulous sound quality playing classical music! especially the cello! must try some piano! and 50 yes 50 RMS loud! and on top of that up to 8 hrs playtime!not what you would get on a cheeper bluetooth device,still trying features ! Rated 4 von 5 von Jude aus Excellent sound Bought 2 of the hk onyx 5 at sprint for $200 each or $215 with tax which was a good deal. so i can pair them as a stereo speakers. Heres what i have observed Amazing sound with good base and clear highs and lows. Easy BT pairing but doesnt really sepearate a left and right speaker. Loudness of both speakers is not enough to justify buying 2 speaker. When the speakers shuts off you have to manually pair them again evertime they shutoff which is a hussle. Rated 5 von 5 von Monkie aus Fantastic kit! Arrived yesterday, took all of 30 seconds to set up, so easy to use. Looks so classy and the sound is stunning. No difference in volume and quality of sound between wired and wireless. Incredibly chuffed and can’t recommend highly enough. Rated 5 von 5 von Vellu aus Upea ääni Avasin hetki sitten paketista ja käyttöön, uskomaton ääni. Tulipa ostettua hyvä joululahja itselle etukäteen, oli DNA tarjous! Toivottavsti kestää muutaman vuoden!? 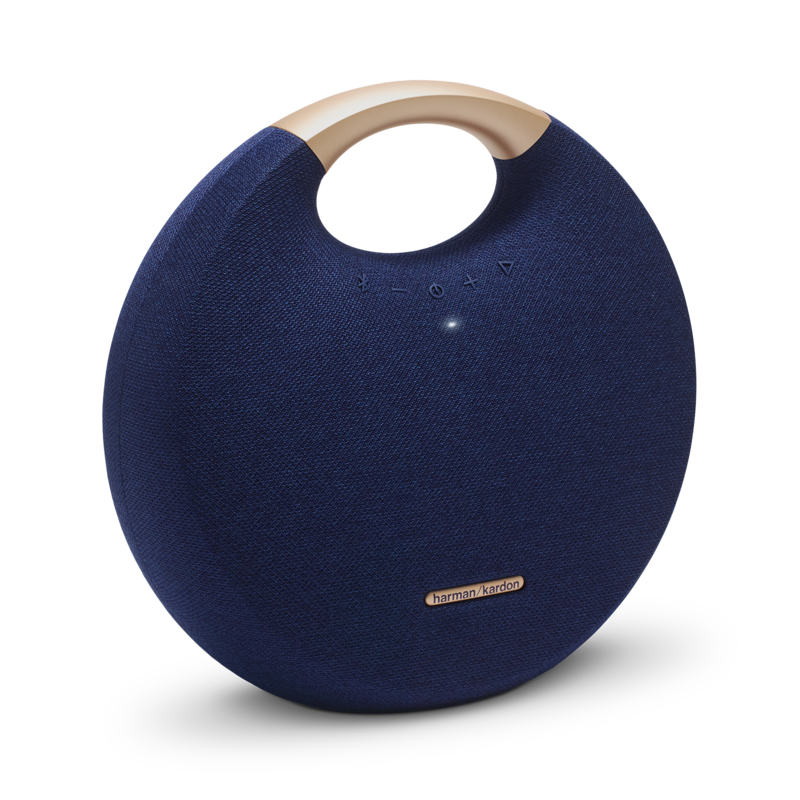 Rated 5 von 5 von SweetT0303 aus Incredible Sound for the Size! I bought my 5 on eBay at auction for $73 however it was the best sound investment I've ever bought. 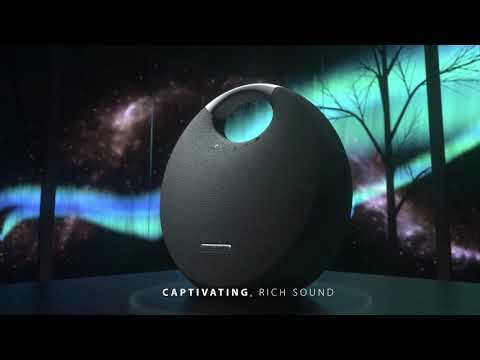 The bass is amazing, crystal clear mids and highs with outstanding surround sound. I friend has the 4 which is another great product however it's not as portable as this one. The alluminum handle and flat bottom sets the 5 apart from the 4! All around best portable speaker I've ever bought! Rated 3 von 5 von Cluefull aus Connect+ :( Den har mindre baggrundsstøj end HK 4 og så har den også lidt bedre bass. Det er dog utroligt skuffende at den ikke kan parres med andre højtalere end kun en enkel af samme slags aka en anden HK 5. Det gør at det næsten ikke er det værd da HK 4 kan parres med mange flere uden det nødvendigvis er af samme generation/mærke - HK 4 kan parres med flere forskellige højtalere inklusiv nogle af JBL højtalerne hvilket er vildt fedt. Comment fait-on la mise &agrave; jour logiciel de l'enceinte via le port USB ? Hej! Kan jag koppla ihop Onyx Studio 5 tillsammans med harman/kardons andra station&auml;ra produkter, typ &quot;Citation 300&quot;? F&aring; dem att spela upp musik samtidigt. Studio 5 har inte st&ouml;d f&ouml;r Chromecast eller hur? Tack! Can I connect my Onyx Studio 5 to a television? You can connect your HK Onyx Studio 5 to your TV via Aux cable. If your TV has a Bluetooth transmitter then you can pair them together as well. 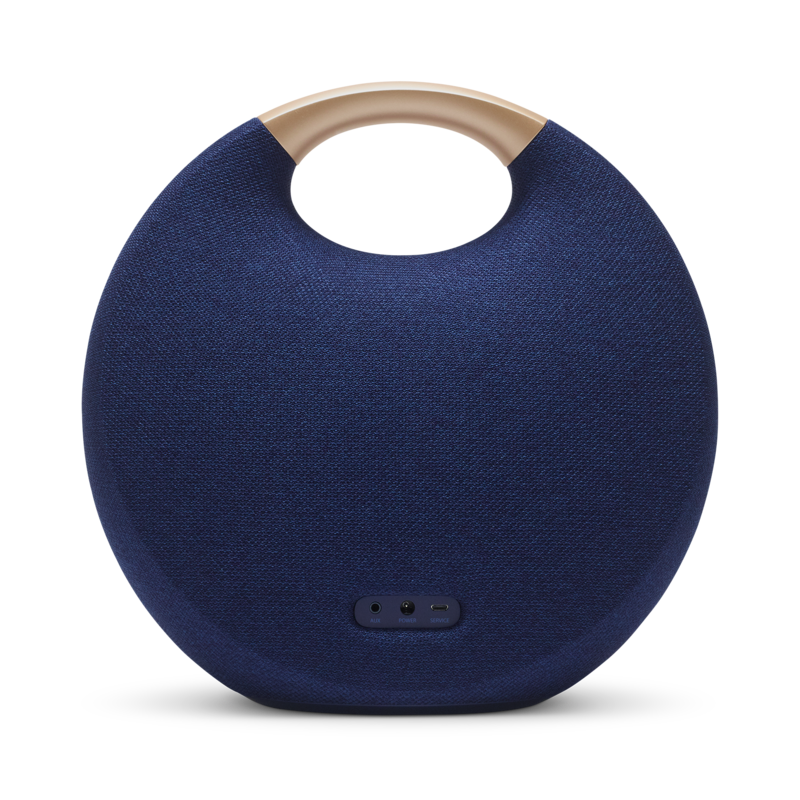 However, you may experience latency or audio/video sync issues when watching TV with the Bluetooth connection since the speaker was designed more for MUSIC and not video. 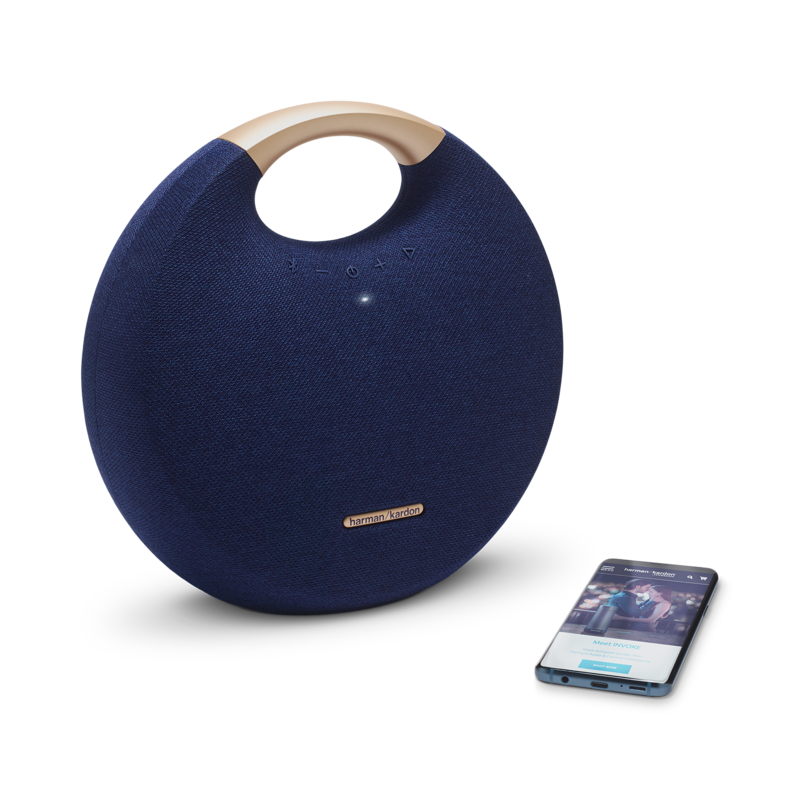 If you have further concerns, please submit a case request at https://www.harmankardon.com/support-contact.html and the Customer Service Team will be more than happy to assist you. Thanks. Can you use it while it is plugged in to the charger? Will it keep charging? Thanks for reaching out. Yes, you can still use it while charging. It also stops consuming energy when it reaches it maximum capacity. If you have other questions or any inquiries, please submit a case request at https://www.harmankardon.com/support-contact.html and the Customer Service Team will be more than happy to assist you. I had my onyx studio 5 for about 5 months now and today it just suddenly stopped charging. The light doesn't indicate that it is charging anymore and i don't know how to fix it at all. Any way to fix this problem? The Onyx studio 4 has a rated power of Rated Power 4 x 15W (AC mode); 4 x 7.5W (Battery mode) .While the Onyx studio 5 has a rated power of 1 x 50W RMS Bi-amp (AC mode). Bonjour, Il n'y a pas de manuel d&eacute;taill&eacute; concernant les boutons/fonctionnalit&eacute;s sur l'enceinte... Comment savoir quel est son pourcentage de batterie, qu'appuyer 2 fois sur la touche lecture passe &agrave; la chanson suivante (j'ai vu &ccedil;a dans les avis) etc? Bonjour Merci pour votre question. La meilleure option est de vous rendre sur la fiche produit, le manuel est disponible, il vous sera d&eacute;taill&eacute; toute les fonctions de l'enceinte. Si vous souhaitez recevoir une assistance personnalis&eacute;e, nous vous invitons &agrave; contacter le Service Client&egrave;le Harman par t&eacute;l&eacute;phone, par mail ou par chat. Vous trouverez toutes les informations de contact sur https://www.harmanaudio.fr/support-contact.html#ns. Merci.